Red Barn Free Range Farm sells only the very best local food. You can shop online or you can visit our free range farm shop. Red Barn Delivers to your home or office from PE to CT.
See delivery schedule and prices here..
Hi, I’m Lindy your local Free range Farmer! Red Barn was started in 2009, and has grown to become a household name in many of our local towns. Our business is still, tiny, but we grow the best totally free range chicken & eggs that you will ever eat! 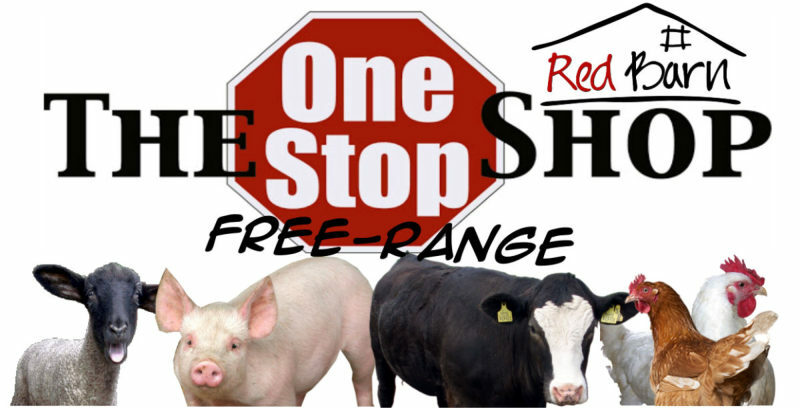 We also supply free range beef, pork, lamb and a full range of dairy products. All our products are locally grown and delivered directly to you from Red Barn Farm. It goes without saying, that we do not use antibiotics, nor do we inject brine into our chickens. Ethical, humane, sustainable farming is our goal. However, we do have select shops in various areas that supply our goods. There are also some “Chicken Clubs” that are groups of customers that order together monthly and share delivery costs. See our suppliers page to find out what is available in your area, or you can just order in our online shop and we will deliver to you directly. Our products are of the highest quality and we try to keep our prices low by cutting out the “middle man”. Why not change to free range? You will be so glad you did! 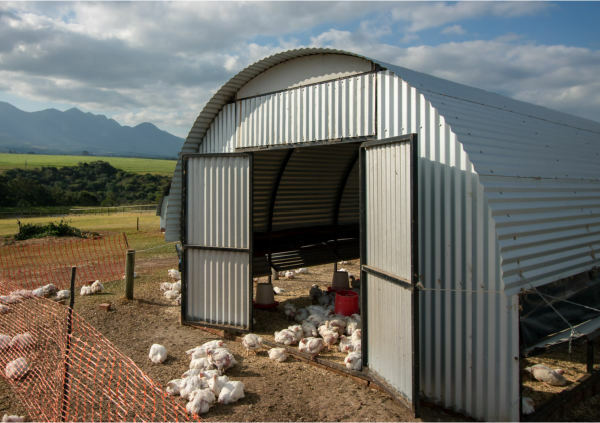 Visit our farm in George, just near the airport. I will be happy to show you around. Our hens are specially selected for their hardiness. 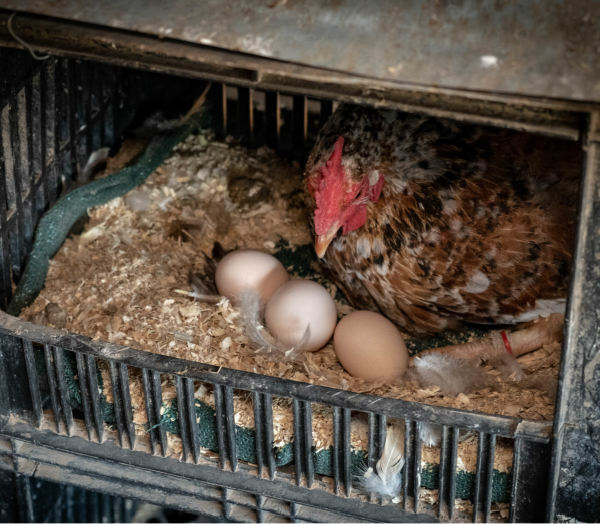 Growing chickens in a free range environment means they need to be tough and savvy to withstand predators and the elements. 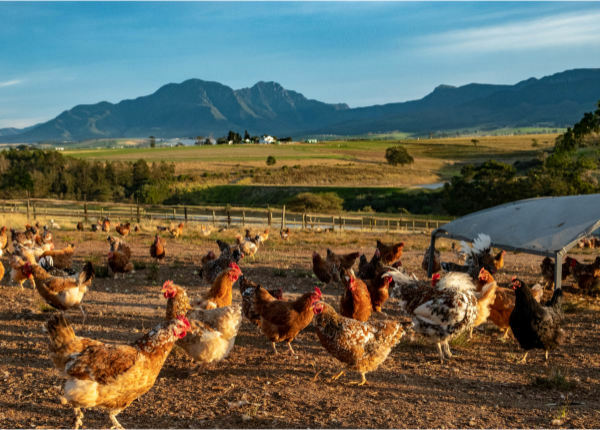 Our Boschveld hens are indigenous to South Africa. 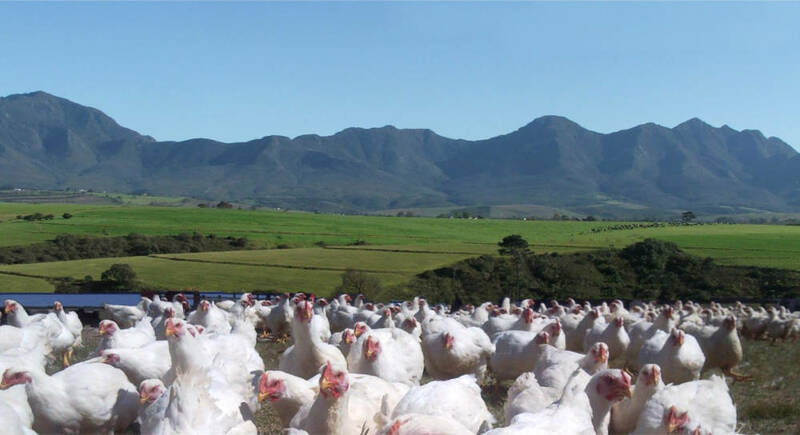 They are also localized, which means that they have adapted to the conditions on our farm and on the Garden Route. 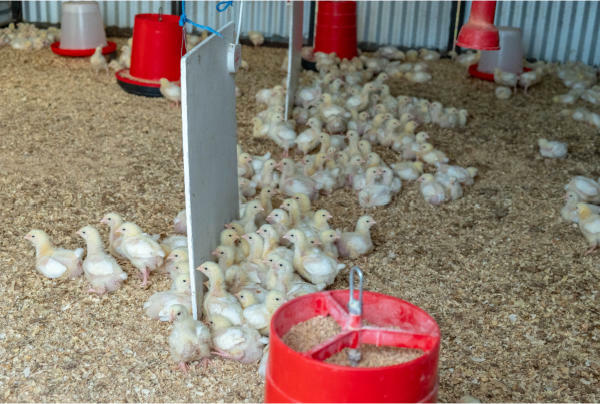 Red Barn sources our broiler day old chicks in Mossel Bay. The chicks are brought to us only a few hours after being hatched. 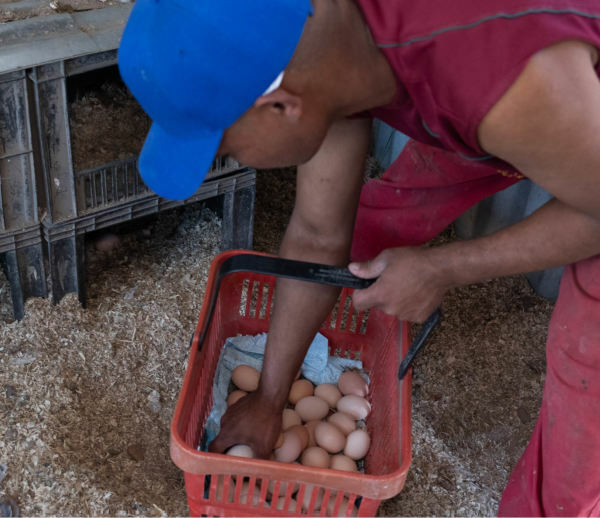 We believe it is important that chickens are not stressed in any way by transporting them long distance. Our chickens are grown for eight to ten weeks. 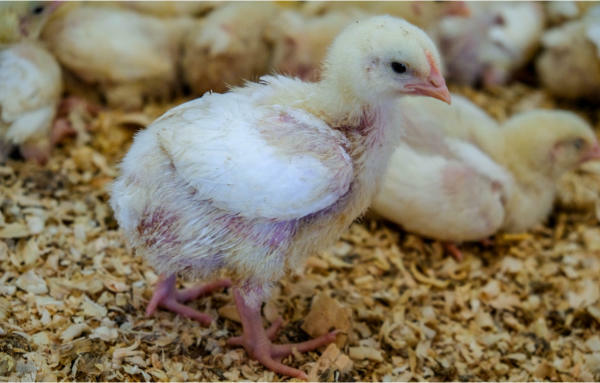 Baby chicks are kept warm and under lights for the first three weeks and then slowly let outside to enjoy the sunshine. We keep them in small batches so they always have plenty of space and can go outside at any time. We are always asked what we feed our chickens. 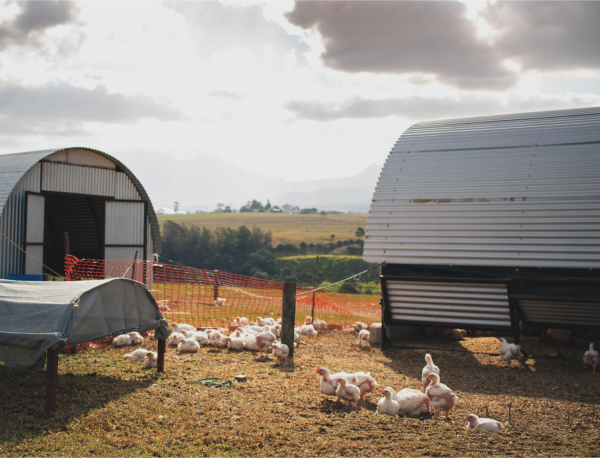 It is important to understand that chickens need a balanced free range ration. So many people think chickens can just roam around and feed themselves! This is just not true. This means they can eat as much as they like, when they like. We use all natural products like garlic, origanum oil, Diatomaceous Earth, lime etc to combat germs and disease. In short, we try to grow our chickens as close to nature as possible. Why not click on the button and have a look NOW? Go Free range Shopping click here! Over the years of dealing with Red Barn, I have come to really trust their products and the way they farm. Most importantly, I feel that through the weekly communication, I am part of the Red Barn family! Dearest Lindy and Filip, I have for many years so enjoyed being one of your customers. Fresh, organic, free range, high quality food is not only palatable but so supportive of health and well being. My dog Wrolf, and cat Tabby also love your beef and chicken pet mince which I give them raw for breakfast. It is on my never ending list To Do list to come and visit you both, and the farm – when will your coffee shop open? Blessings for ever on your good work. I have been dealing with Red Barn for years and I can only praise Filip, Lindy, Jenny, Gibson and all the rest of the staff we never meet. Congratulations on a great job. You are one of the few reliable, honest and of course pleasant businesses in George. Our family absolutely love your chicken, there is nothing like it elsewhere. The first time I was aware of you was when I went to the Strawberry farm because of the sign and then I could NOT find you from that side. But, I persevered and ended up from the airport side, much easier, and stocked up from then on about once a month or so. I passed you on to many of my friends and we are all most impressed not only with the delicious taste of the chicken but also of your ever soooooo friendly service. Keep it up and good luck with what ever you do, you got a happy knack to succeed. Have a wonderful day! Over the last few years it has developed, slowly, into a non-negotiable Friday 11 am coffee/green milkshake treat every week for old and new friends , meeting at The Roost, Old Nick, Plett for a catchup on life. (We’re all sooo busy) and to wait for the magic noon hour delivery of the Red Barn truck!! Nobody could imagine how important this date is, nor how grateful we are to have met Filip, and now Gibson, who delivers the orders magically grown, sourced and packed by a team which must surely be The Best In The World!!! FODUX would like officially to thank and appreciate the George contingent for all their exhausting efforts, early hours into late nights, always with tangible happiness for us to feast on, enjoy and share! We visited the farmshop last weekend and was really impressed with the range and quality of products. The farmer Lindy was there and told me all about how they look after their chickens and the trouble they go to to ensure that the end products are as safe and healthy as possible. As you guys know I just think you are awesome. I have learnt in time its not only about having great quality products but also good consistent service. Taking the effort to care for PEOPLE. Organic business also means ORGANIC relationships and maintaining these on client side as well as supplier side is vital part of business. You guys have all this and you are consistent with it. It’s hard to find a manager who loves your business and its relations the same way you do. So that when you step aside to travel a bit you know everything is being taken care of. You have a real gem in Jenny as I feel she loves and cares about your business as much as you do. You really are doing beautifully. We ordered for the first time from Red Barn. I live in Cape Town, delivery was prompt. Produce was awesome. The butter so tasty and the eggs oh so yum. Looking forward to placing my next order. I am hoping to get a few people on board to help share the courier costs. Thank you Red Barn on very happy chicken eating fan. Ooh and the chicken wings awesome not to even start with the pastrami.. The best products and the most friendly owners. It’s wonderful to know it’s all free range, antibiotic and hormone free! We had a wonderful morning with our home school group at Red Barn Farm this week. Thanks so much to the team for making us feel so welcome and for the very informative tour. I have never seen so many happy chickens in one place! I love everything about Red Barn. Their amazing quality. The people and service. Regular specials weekly, and most importantly the way they farm. Thank you Red Barn for farming the way farming should be done!!!! (whatever was first, I do not want to start a new discussion!) with the friendliest staff! A happy chicken is a tasty chicken!! More farmers should let their chickens roam around as they wish like you do!! Lovely products, lovely people. The only pork I can eat with a clear conscience. Absolutely LOVE their chicken sausages, all their products are tasty! Without reservation, your products are excellent quality always and your staff friendly and helpful. Its great for us to have products like yours available. I had some of your chicken tonight for the first time, WOW WOW WOW! It was the best chicken I’ve ever had! You can taste that it came from a healthy farm! Friendly people that are passionate about what they do. They do REAL free range, not the pseudo free range you find in the shops. The sundowner wings are simply the best. There are other good locally produced items available at the shop. Honey, yoghurt and butter are the best in the area. Also try the delicious egg based grain free pasta they sell at the store. They also deliver. Best eggs and best chickens! Truly free range and great people! 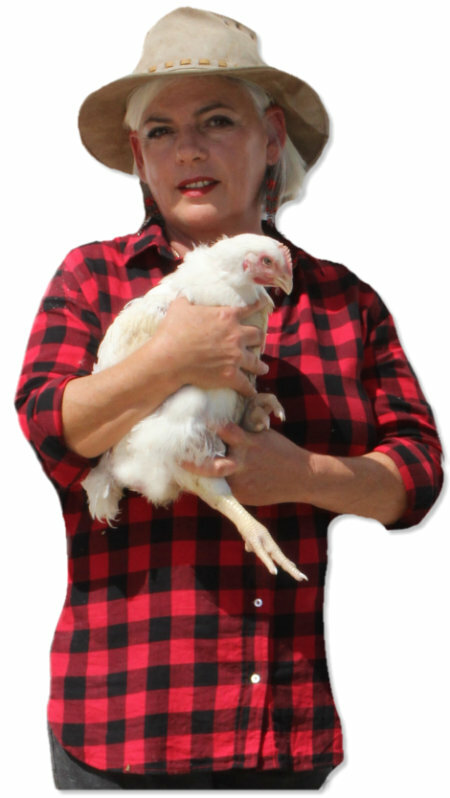 Red Barn have the most amazing healthy chickens and a beautiful farm. But, you must see for yourself! Finally, I found the best free range farm food! For this reason, I order every month. In addition, I have told all my friends about Red Barn. Contact Red Barn Free Range farm by phone (044 876 0014/081 258 1725) or email. 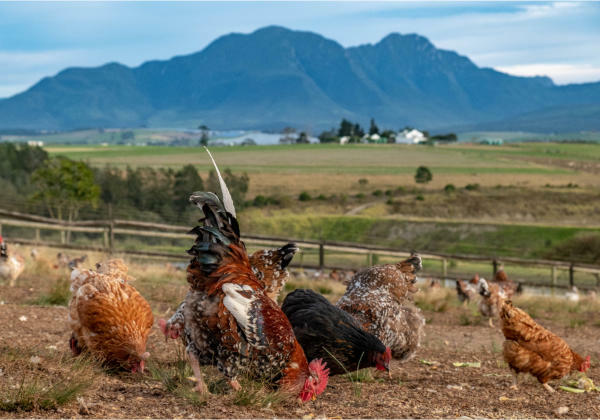 Finally, join the RED BARN FARM Family – change to FREE RANGE – enjoy your food even more!